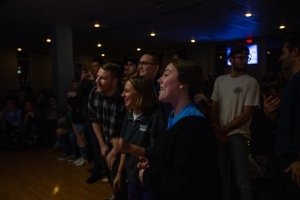 Madipalooza, one of the biggest yearly events at JMU, provides a space where everyone, no matter age or background, can come together and unite over their love of music. For such a high-profile event, how could anyone possibly determine who would perform the ever-important opening act? With a battle of the bands of course. On March 13, 2019 at 7 pm, UPB hosted Rumble Down Under. Here, four musical acts, two bands and two solo acts, had 25 minutes to give it their all and impress the audience and the judges. 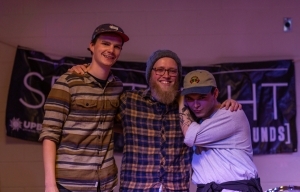 Among these judges were Dr. Tim Miller, a Madipalooza event coordinator, and a member of Gryzzle, the band that won last year’s Rumble Down Under. The evening started off strong with 18-year-old local, Matthew Mozingo. This singer-songwriter performed chill jams that got the audience members grooving. Matthew began playing guitar two years ago and classifies his style as soft rock. He performed covers of songs by Shawn Mendes, as well as original pieces. Next up on the stage was the band Color Me In, a four-person band consisting of JMU students. In a stark difference from the first performer, this band was loud and energized. Audience members were encouraged to get on their feet and sing along. This alternative rock band performed original songs that the audience eagerly jammed to. The stage presence of the band created a fun and interactive environment between the musicians and their fans. Following up that energetic performance was Angus Quinn, a talented singer-songwriter. His mellow performance created a space for audience members to find peace in the music. The majority of the songs that he performed were originals, which added to the intimate vibe that the musician created. As each song moved seamlessly into the next, the crowd was able to connect with Angus and feel the emotion that he put into every song. The love that this group had for music and performing was evident. Members danced on stage and encouraged the audience to join in the fun. The passion that the band felt in their high energy performance transferred to the crowd, sparking lively interactions between the two groups. After these four amazing performances, the judges were left to deliberate and decide a winner. As the musicians anxiously awaited the announcement, audience members gathered around to congratulate all on a job well done. Each group brought a unique style and reminded the audience of the power and energy that music could have. When the judges reached a decision, they were eager to announce that the winner was Lilac War! Lilac War will be performing again at Madipalooza! If you missed this competition don’t fret. You can still catch Lilac War at the 9th Annual Madipalooza on April 13!